Being a good caregiver requires more than any single tip can provide. After all, there are no two people in the world who are the same. Each of our loved ones who needs our help deals with different challenges. Every single one of us caregivers encounters problems that no one else has faced before. However, empowering your caregiving abilities starts in one place. Taking this simple step can help you overcome your daily challenges – or even thrive despite them—and help you provide the care that your loved one needs. As your loved one’s caretaker, you act as a sort of guide. What does a guide have that those who follow them do not? “Knowledge”. Imagine that you are hiking up an unfamiliar mountain. You know that the terrain might be treacherous in places, but you don’t know what signs to look for as you walk. You might encounter predatory animals, rock slides, or an unfriendly climate. Because you don’t have the knowledge needed to brave such a journey, you hire a guide to take you. This example is just like caregiving – except; you are the guide. Though you do not feel the effects of what your loved one is going through directly, you still walk their path with them. You’ve got to educate yourself about the twists and turns along the way, the roots and stones that line the trail, so that you can be prepared for whatever may come. That means you need to know as much about your loved one’s condition as you possibly can. You need to be an expert, whether on dementia, Parkinson’s disease, heart disease, Alzheimer’s, or stroke recovery – whatever your situation. Education begins with knowing where to start reading. The internet has been great for the spreading of knowledge, but you can’t always trust that what you’re reading or watching is true. Because of that, Granny NANNIES recommends starting with these resources. 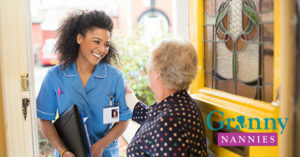 Not only will you find the knowledge you need to be a better caregiver but you may also be able to connect with others who are experiencing things similar to your situation. No matter where you are in your caregiving journey, Granny NANNIES Miami is here to help. We offer a variety of short- and long-term services to help you and your loved one get past the challenges you both face and get on with your lives.